Volume: 6Date: 2011-10-01Original Date: 2011-10-01Title: Section 565.14 - Motor vehicles imported into the United States.Context: Title 49 - Transportation. Subtitle B - Other Regulations Relating to Transportation (Continued). CHAPTER V - NATIONAL HIGHWAY TRAFFIC SAFETY ADMINISTRATION, DEPARTMENT OF TRANSPORTATION. PART 565 - VEHICLE IDENTIFICATION NUMBER (VIN) REQUIREMENTS. 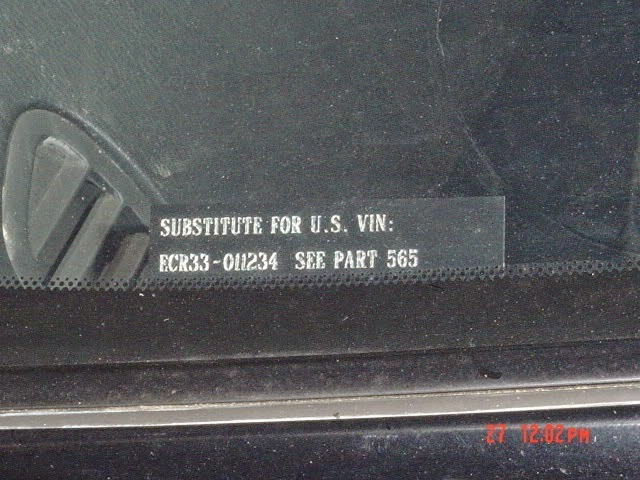 Subpart B - VIN Requirements. 565.14Motor vehicles imported into the United States. (a) Importers shall utilize the VIN assigned by the original manufacturer of the motor vehicle. (b) All passenger cars, multipurpose passenger vehicles, low speed vehicles and trucks of 4536 kg or less GVWR certified by a Registered Importer under 49 CFR part 592 whose VINs do not comply with part 565.13 and 565.14 shall have a plate or label that contains the following statement, in characters that have a minimum height of 4 mm and the identification number assigned by the vehicle's original manufacturer inserted in the blank: SUBSTITUTE FOR U.S. VIN: _____ SEE 49 CFR PART 565. The plate or label shall conform to § 565.13 (h) and (i). The plate or label shall be permanently affixed inside the passenger compartment. The plate or label shall be readable, without moving any part of the vehicle, through the vehicle glazing under daylight conditions by an observer having 20/20 vision (Snellen) whose eye-point is located outside the vehicle adjacent to the left windshield pillar. It shall be located in such a manner as not to cover, obscure, or overlay any part of any identification number affixed by the original manufacturer. Motor vehicles conforming to Canada Motor Vehicle Safety Standard 115 are exempt from this paragraph.